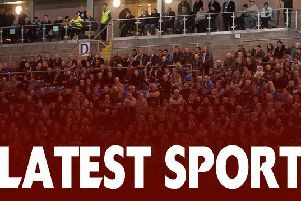 Richard Marshall was left to rue his side’s “shocking’ discipline as they went down 40-16 on the opening day of the Championship season at second favourites Widnes. The visitors were caught cold at the Halton Stadium, with the Vikings going 16-0 up early on before Marshall’s side closed the gap to 16-10 approaching half time with tries from Will Sharp and Steve Tyrer. But they found it impossible to stay on the right side of referee Scott Mikalauskas all afternoon, conceding 15 penalties in total and having Brandon Moore and Kevin Larroyer sin binned after the break as the Vikings built a decisive 34-10 lead with three tries either side of half time. “We’re disappointed with the performance as a whole,” said Marshall, whose side host Leigh, who had a surprise home win over Toulouse, at the Shay next Sunday (3.0). “Widnes were flying at the start, got some kicks away, put us under pressure on the edges and got 16-0 up. “Danny Craven has a very good kicking game and we needed to be more decisive on those kicks. “Put the kicker under more pressure, but also go and deal with what they come up with. “We needed to be a lot better on those, because to come back from 16-0 down was always going to be tough against a team like that. “We came back within a try, but that try just before half time hurt us and they pulled away in that second half. “They’re a full time team, well coached and they’ve had a good pre-season. “But it was way below the standards we set ourselves; our second half was way off. “Our discipline was shocking; we had 15 penalties against us and two players sin binned. “The game is hard enough when you’re playing it right, knocking your sets out and tackling with good technique. “I think we managed to concede a penalty when we had the ball as well, which is just ridiculous. “Even half of 15 is too many, we have to be better than that. “Hopefully we’ve got them all out of the way for the season today. “Our defence just couldn’t sustain the amount of penalties we were giving away. “We scored some nice tries and we made some more opportunities too. Predictably, it was the Vikings’ big money centre signing Anthony Gelling who did most of the damage, scoring two tries himself and proving a major distraction for Fax’s left side defence all game as his winger Ryan Ince finished with a hat trick. “Anthony Gelling is a class player,” said Marshall. “He’s probably on 10 times as much as some of our players. “I don’t know whether he was 10 times better, but he was certainly very good. But one man who should have played - the Castleford forward Mitch Clark - was a late withdrawal on Saturday, opening the door for St Helens loanee Liam Cooper. “I was really happy with young Will,” said Marshall. “He’s been the best of those young forwards in the friendlies and he deserved his chance. “I was pleased with the way he went today. “Mitch got pulled by Castleford, that’s one of the down sides of including dual reg players.